1. Speech too pompous for an occasion; pretentious words. 2. Grandiloquent, pompous speech or writing. 3. Language that is intentionally difficult, usually to make something sound more important than it really is. 4. 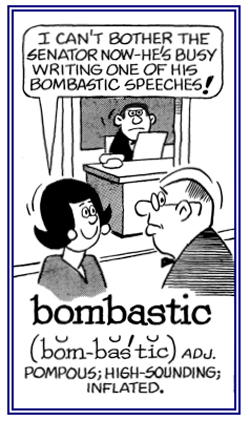 Inflated or turgid language; high-sounding language on a trivial or commonplace subject; "fustian"; "tall talk". 5. Cotton or other material used to stuff garments; padding. A language that is full of long or pretentious words, used to impress others; nonsense; pretentious talk; and bold and deceitful absurdities. Slang descriptions include: "baloney, hot air". The term originally referred to cotton padding (from Greek to Latin to French [cotton stuffing]); it now means, swollen language or high-flown diction that exaggerates the importance of the subject. The original meaning (now obsolete) is "cotton or any soft fibrous material used as padding or stuffing". It is derived, through Middle French bombace from Medieval Latin bombax, which means "cotton", in spite of the fact that the original Latin bombyx and its Greek source refer to silk. According to one source, the shift was occasioned by an error going back to the Roman scholar Pliny, who had reported that cotton was produced by an insect analogous to the silkworm. 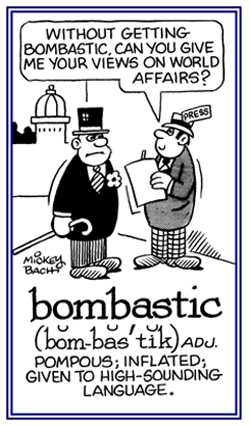 Bombast has been retained in modern English because it took on the figurative sense of "a pretentious or inflated style of speech or writing". So the basic sense of "stuffing or padding" has survived, but now the stuffing consists of words rather than cotton. Someone who stuffs or pads things. 1. A reference to speech, writing, etc. : high-sounding; high-flown; inflated and pretentious: While on the campaign trail, Senator Smith frequently made bombastic speeches. 2. Pertaining to the use of long and difficult words; usually, to make people think that the speaker knows more than he or she is really capable of producing: The young man tried to impress his new friend by using very bombastic language instead of speaking simply. 3. Of the nature of being inflated or turgid: The local bank manager had quite a bombastic impression of himself in terms of his importance to the national bank. 4. Ostentatiously lofty in style: Paul Jones, the president of the university, often gave the most bombastic speeches; especially, when the members of the Board of Directors were present. © ALL rights are reserved. 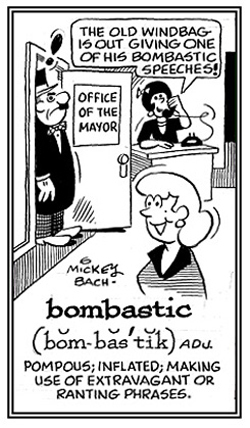 In a bombastic manner, with bombastic language. Of or pertaining to cotton. Twilled silk cloth with worsted fabroc or cotton. Of, like, or pertaining to silkworms. Of, like or pertaining to silk or cotton. A genus of moths, the silkworm moth. To take the stuffing out of something.